This was, in fact, an incredibly simple dinner based on an inexplicable, but very precise, craving I had for whole wheat noodles with cheese and greens. It ended up consisting of an entire head of curly kale, a quantity of ricotta cheese, and a package of loose hot Italian sausage. 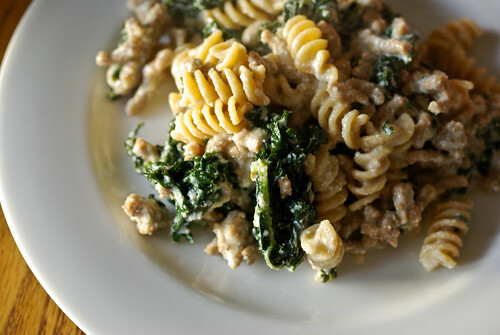 I cooked the sausage and the kale together until the greens were very soft, then added the cheese, mooshed it all up together with some pasta cooking water and tossed it with Barilla whole grain rotini. It was quite excellent, very earthy and comforting. Also very filling. I would definitely make this again, but I’d also like to try it more like my original idea, which was going to have bits of stinky cheese instead of the ricotta, no meat, and possibly a sprinkle of pine nuts. 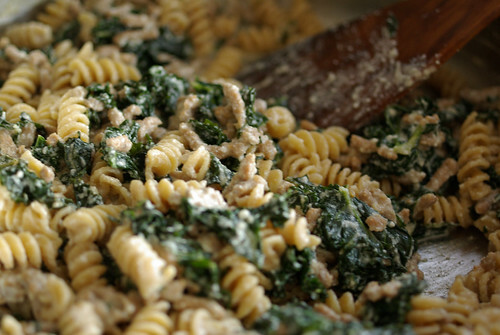 What would you add to whole wheat pasta with greens?